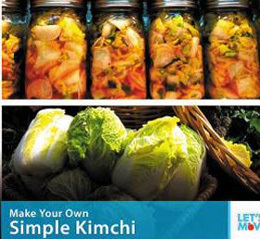 U.S. first lady Michelle Obama last Thursday tweeted a simple kimchi recipe that sent the blogosphere in Korea abuzz. Making the staple Korean dish is a fairly laborious process even for most Koreans, requiring the preparation of ingredients, mixing them with red pepper and storing them in containers to ferment over a certain period of time, which is why many Netizens here were so impressed. The tweet said, "Last week, we picked Napa cabbage in the garden [at the White House]. Now we're using it to make kimchi in the kitchen. Make it at home." She also tweeted a photo showing jars of the kimchi she prepared with her own recipe. The U.S. first lady is leading the "Let's Move" campaign to combat obesity and encouraging a healthy diet. Her recipe seems as simple as preparing salad. Just marinate two heads of cabbage in one cup of rock salt, wring them, and add one tablespoon of ginger, four minced cloves of garlic, sliced scallion, a small sliced white radish, and five tablespoons of Thai peppers or powdered Korean red peppers. Seal in a container and refrigerate. The recipe is slightly adapted for American tastes with a cup of sugar, and vegetarians are advised to leave out the fish sauce. The Korean dish has gained popularity in the U.S. thanks to celebrities such as Hugh Jackman, Gwyneth Paltrow and Jessica Alba saying they enjoy it. Kimchi has also become popular among the style-conscious in New York and Los Angeles. The Washington Post described it as "affordable healthcare" as it is an "anti-aging" food rich in fiber and vitamins.